A 2-stage evaporative cooling system (aka "indirect/direct" cooling) represents the most advanced cooling system - utilizing evaporative cooling technology. This cooling option is much more energy efficient than cooling with refrigerant (standard air conditioning), but it's not suitable for all cooling applications. To discover if your home meets the necessary requirements for 2-stage evaporative cooling, get in touch with your local Dr. Energy Saver! Click below to discover our certified dealers near you. 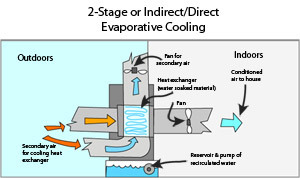 How does 2-stage evaporative cooling work? 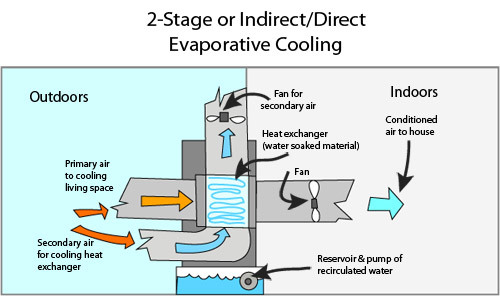 Let's explain 2-stage evaporative cooling in terms of the stages of cooling that occur. In the first stage, hot outside air passes inside a heat exchanger that is cooled by evaporation on the outside. During this initial cooling phase, the incoming air stream doesn't pick up any extra moisture. In the second stage, the same air stream passes through a water-soaked pad where the additional cooling takes place and the air picks up some additional humidity. A two-stage evaporative cooling system can deliver cool indoor air with a relative humidity in the 50%-65% range, while direct evaporative cooling systems typically condition the air at around 70% relative humidity. According to the American Society of Heating and Engineers (ASHRAE), advanced two-stage evaporative coolers can use 60%-75% less electricity than conventional refrigerant-based AC systems. While this makes evaporative cooling a very attractive option in terms of energy efficiency, it's important to note that these systems are best-suited for the hot, dry climate found in the American Southwest. Think indirect evaporative cooling is a good fit for your home, or interested in learning more about all of our systems? Dr. Energy Saver can provide personalized information based on your home. Contact your local dealer today!